I loved Martin Lawrence’s show from the 90s, and my favorite character he plays is Jerome! 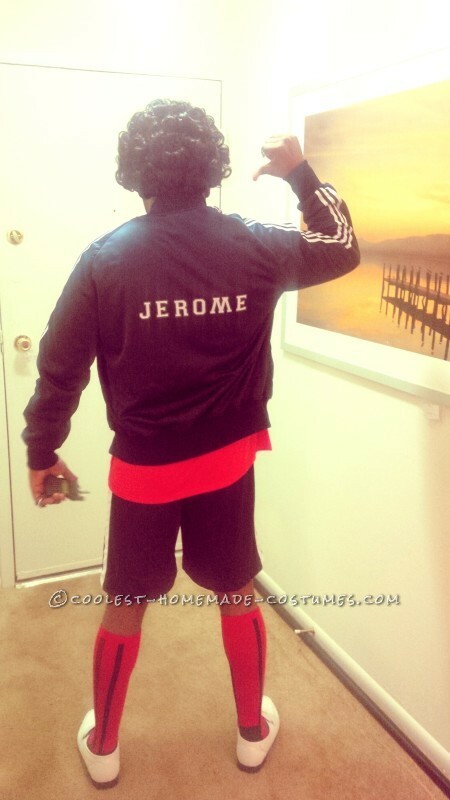 Jerome is a ridiculously hilarious wannabe playa who has really bad dental hygiene and loud taste in clothing. He house is even covered in leopard print. The outfit I did was the one he wore when the character was first introduced to the series in a nightclub. Not only does he look ridiculous he also has some one-liners that makes his character memorable. I did his classic intro song in my video. I knew first the hardest part of this costume would be finding a sweatsuit that looked retro, so I went to the local thrift shop and got lucky! I also lucked up on the shoes and found white glossy loafers. I then went to the arts and crafts store to find iron on letters. I then went to numerous dollar stores to find the gold teeth, and ridiculously loud jewelry! The Mercedes Benz emblem he wears I had to make myself, and is essential to this costume because he actually uses that Benz chain in his pickup lines. I then went to a toy store to find the retro phone and created the fake beard with wig hair and felt a sheet. I then took some elastic and stapled it to the felt to it would stay firm. 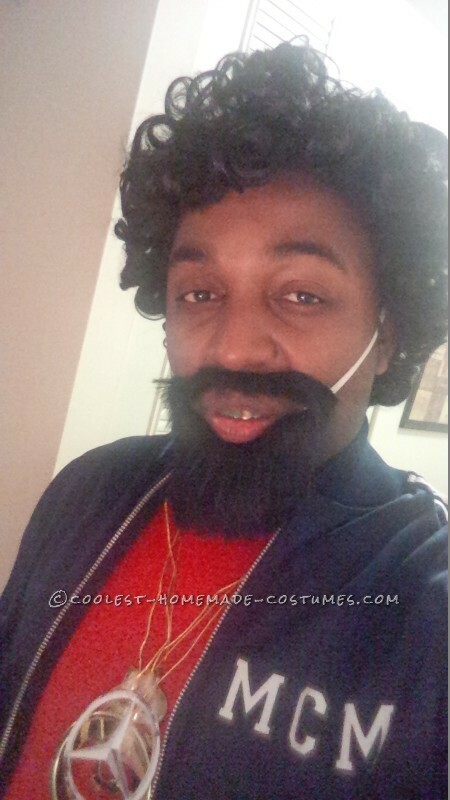 Lastly I had to find a wig worthy of the Jerome costume. You can’t use a regular afro wig because Jerome’s curls are really big, so I went to a women’s wig store and got some help from the ladies there. 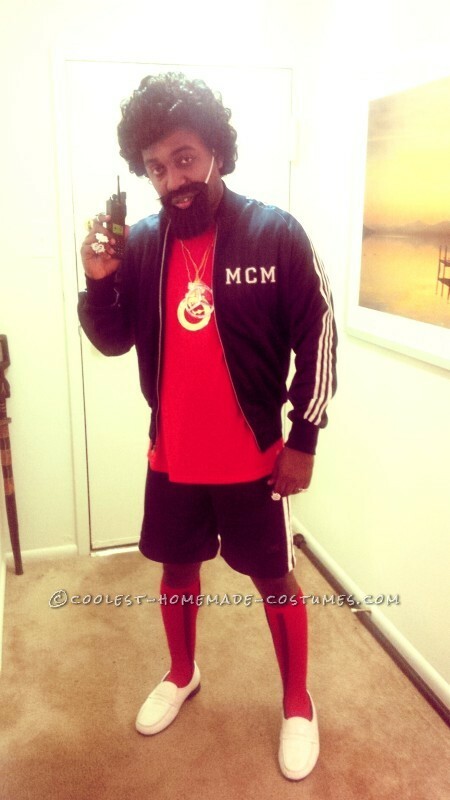 After I ironed on the MCM logo and the Jerome name on the back the costume was complete. I first posted the picture on Facebook, and people lost it! They thought I looked just like him, and I got so many good reactions, I decided to enter the contest. I was surprised even young kids under 18 knew who I was. At the party I attended I had people singing the Jerome song all night with me and taking pictures. This was a very fun costume, and I’m glad it brought lots of smiles with it. DIY Wall-E and E.V.E. Costumes for the Happiest Kids Ever!